The Xperia V looks very similar to the Xperia T, with a slightly smaller, 4.3-inch 720p HD display, thinker 10.7mm chassis and tipping the scales at a lighter 120g. You'll find a 1.5Ghz dual-core processor powering Ice Cream Sandwich inside the Xperia V, which is the same as the T, but Sony has also managed to squeeze in 4G LTE connectivity, allowing you to take advantage of super speedy network connections. The arched back harking back to the late Xperia Arc Sony Ericsson handsets is clad in rubber, allowing for a comfortable and secure hold, and the Xperia V feels solid and well built – overall a design we're fond of. Interestingly for a water and dust proof handset, you can take the back off the Xperia V, giving you access to the full-size SIM card slot and removable battery – there's no obvious signs of watertight-ness around the back cover and we managed to peel it off easily, making us question if we'd trust taking this phone for a dip. However our mind was put slightly at rest, as another Xperia V handset was getting a regular shower on the Sony booth – confirming its IPx5/7 certificate credentials, the highest level of water resistance currently on a phone. There's just a couple of buttons on the right side of the Xperia V, a volume rocker switch above the power/lock key – an unusual layout as the lock key is usually on top, which meant we found ourselves hitting volume up when trying to lock the phone. A covered microUSB and 3.5mm headphone jack can be found on the left and top respectively, helping to keep the water out, and we found the covers were easy to remove and clip back in. Although the Xperia V is packing the same power as the Xperia T, Ice Cream Sandwich doesn't feel quite as nippy on this 4G, waterproof handset. The Sony Xperia V isn't slow, it just lacks the finesse of its bigger brother, and that puts a slight dampener on things. Apps take that extra half a second to load, which is noticeable if you've just been using a quicker phone, and the camera app loads up in a couple of seconds. The Xperia V is blessed with the same 13MP sensor as the T, and this allows you to snap high quality photos, with a range of effects and scene modes to choose from, plus auto-focus, 16x digital zoom and an LED flash to aid your photo taking escapades. There's a second or so delay from pressing the shutter to the phone snapping a pic and making itself ready for the next, but we didn't find it to be a particular problem. For those of you who like a physical shutter button then you're out of luck with the Xperia V, as an on-screen trigger is your only option. The 4.3-inch screen sports Sony's Mobile Bravia Engine 2 technology, which increases the quality on the 720p display, making movie watching a pleasing experience. We did notice that colours appeared a little washed out at times, but this didn't detract from the overall performance of the Xperia V during video playback. Sony's Walkman and Music Unlimited apps are also present on the Xperia V, giving you access to an attractive and easy to use audio player and music streaming service. If you fancy bit of gaming on the go then you'll be pleased to learn that the Sony Xperia V comes PlayStation certified – allowing you to play past console titles on your mobile phone. As far as typing goes you are greeted by the standard Android keyboard in messaging, social networking and emailing applications, but Sony does offer a personalisation wizard, allowing you to fine tune the board to your preferred settings on the Xperia V.
The simple step by step guide meant we dramatically improved the keyboard for our style of typing within a minute and it's a nice feature from Sony, which we wish more manufacturers would consider, or even Google itself. Sony is talking a lot about connected devices and the Xperia V comes packing NFC technology, which will be able to talk to other NFC devices, including speaker docks and headphones. Obviously 4G is known to be a bit of a drain on battery life, but the Xperia V comes with a decently sized 1,750mAh battery, which should see you through the day – but we'll put that to the test during our in-depth Sony Xperia V review. 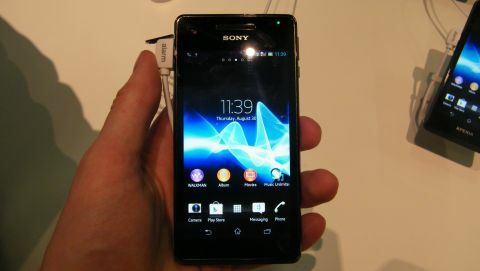 The Sony Xperia V will be available in selected markets during the fourth quarter this year, although an exact release date and price are yet to be announced. TechRadar understands that there are currently no plans to bring the Sony Xperia V to the UK, but it's likely to make an appearance in the US. The Sony Xperia V is a respectable mid- to high-end smartphone and as long as the 4G connectivity doesn't drain the battery and the water resistance tag doesn't let us down in our full review, it looks set to be a strong contender in the LTE market. It may not produce the buttery smooth user experience that some of its rivals offer, but the upcoming Jelly Bean update should improve that aspect, and as long as the handset is priced correctly, the attractive design and large range of media content should make the Xperia V an enticing product.